The inspiration for this row came from having recently returned to live in England, after living in first the Western and then the North Isles of Scotland for 17 years. I decided to create four separate blocks that could be put together to form a 36 inch (finished) row. Two blocks finish at 9 inches wide, one at 10.5 inches, and the other at 7.5 inches wide. However they have been designed so that the key pictorial elements of all the blocks fit easily into a 9 inch square, so these patterns could be made as four standard 9.5 inch (9 inch finished size) blocks. I have made two different versions of these blocks – the first using the freezer paper method I describe in “My applique tool kit” blog post (applique pieces hand-sewn to background). 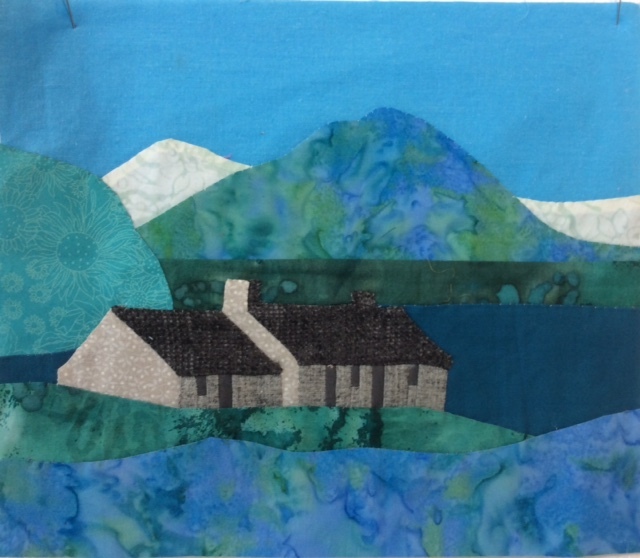 For the second version I still used some freezer paper applique for the landscape elements (hills and foregrounds) but used a fused raw edge applique for the cow, the croft house, the castle and the standing stones and then free-motion stitched by machine. I also simplified some of the background elements. I used Heatnbond but any fusible web that has a paper backing you can trace your shapes onto will work. 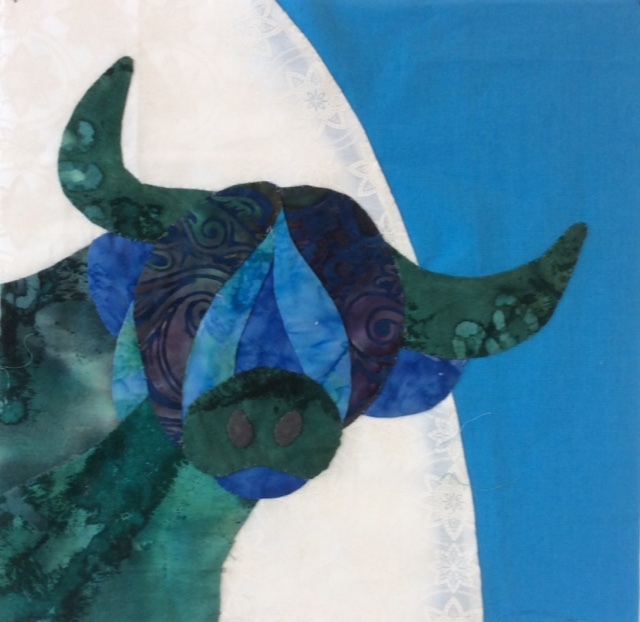 Block 1 is “The Coo” – the big-horned long-haired highland cow. You don’t always see a lot of these around now, but they are quite iconic (as you will see by the number of souvenir “heelan coo” toys at any Scottish visitor centre) . 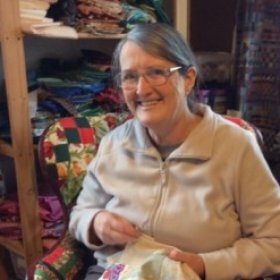 The block isn’t too hard to make with the gently curved pieces built up in layers and either hand stitched (freezer paper method) or free-motion stitched (fusible web method). Block 2 – “The Croft” – This is a fairly typical stone croft house, set in a mountainous highlands landscape. I tried a couple of methods of creating the doors and windows – foundation paper piecing, and fused raw edge applique. The fused raw edge method was easier, however using a combination of foundation piecing for the house fronts and freezer paper applique (with turned under edges) wasn’t too hard. The size of the house also means that you could just as easily leave off the doors and windows and it would still be very recognizable as a croft house. The background was built up in layers – mountains first, then house added, then the foreground. 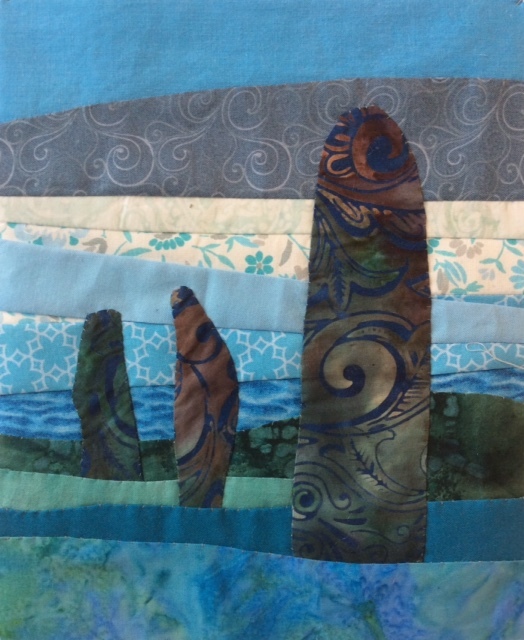 For block 3 I wanted to include some standing stones. When I lived on the Isle of Lewis, one of our neighbours had a standing stone in their croft, and in Orkney, sites of archeological interest were never far away. The three stones here are reminiscent of part of the Ring of Brodgar stone circle in Orkney. Either a turned edge or raw edge fused applique can be used for the stones, and the background is built up in layers. The fabric pattern chosen for the stones does make a difference – in one version I used a swirly batik print, and in the other a scrawly handwriting print where the letters were big enough to not be read as words. Both gave the impression of hewn, carved or weather-worn stones. 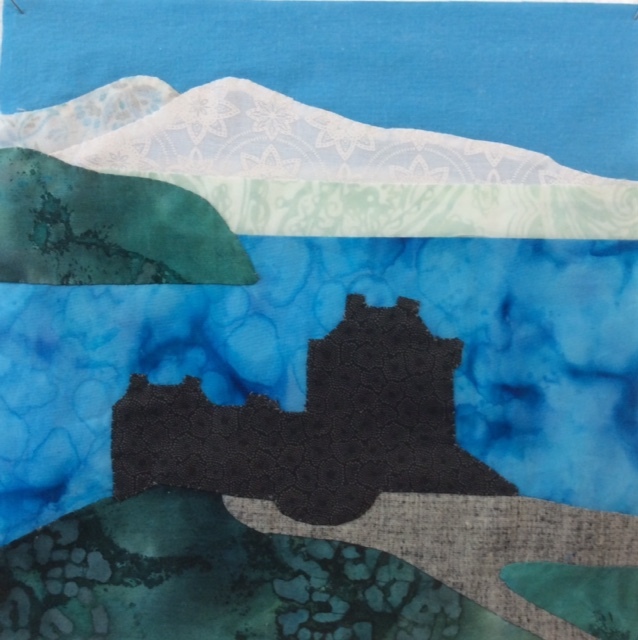 Block 4 – “The Castle” was based on Eilean Donan Castle on the “road to the isles” (Fort William to Mallaig, en route to the Isle of Skye) . This castle sits on an island in an imposing position where 3 lochs met. Scottish castles aren’t always as ornately decorated as others, but they are still very impressive. I hope you enjoy making this row or any of the individual block units in it. Download link for Pattern Pages and instructions for “The Coo, The Croft and The Castle” here. 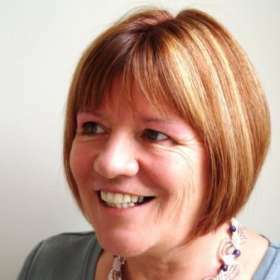 Really love this Corrine and so enjoyed reading your piece.